Getting your hair to look just the way you want can be complicated, but when you have fine hair it can be even worse. Getting a flat iron that will actually make your hair straight but not cause all kinds of unwanted problems is difficult. That’s why we’ve found the best hair flat iron for fine hair. Actually, we’ve found several of them. That way you can find something that you really like and that works great for you. Plate Size: How large are the actual plates that are used with the iron? These are the pieces that actually flatten your hair. Larger plates will get the job done faster while smaller plates may take a little longer. Material: What is the iron made out of? Ceramic plates can be great if your hair is prone to frizzing, but titanium plates can also be high quality and durable. You want to make sure you have plates that you can count on to work. 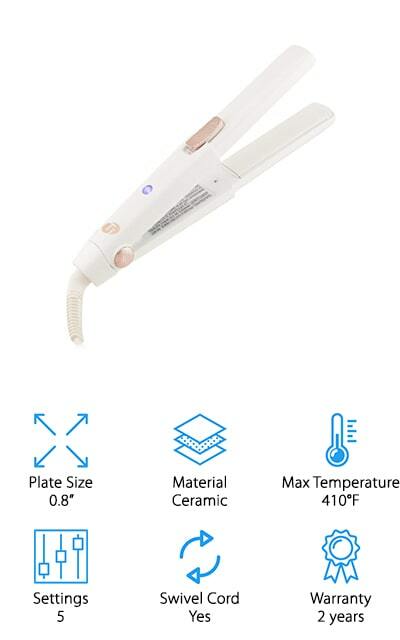 Max Temperature: What is the maximum temperature that the flat iron itself will go up to? You want something that gets hot enough to work with your hair but you really don’t need it to go too hot because it could burn. Temperature Settings: How many different temperature settings are there? Some flat irons only have one and some have several. How many you actually need is going to be entirely up to you, but it’s something to know. Swivel Cord: Does the iron have a swivel cord? That means you would be able to twist it and move it however you want and the cord won’t tangle. This is important if you want to work on different sections of your hair. Warranty: How long is the warranty that you’re going to get? You want a warranty that will last a while because that lets you know the product is going to last for a while too. If you’re not careful you could end up with a problem. There are always plenty of options when it comes to flat irons, but you want to make sure you have something that will work for even the finest of hair. We’ve done some research and found several different options so you can choose what you want. Just make sure you take a look at this top ten list. 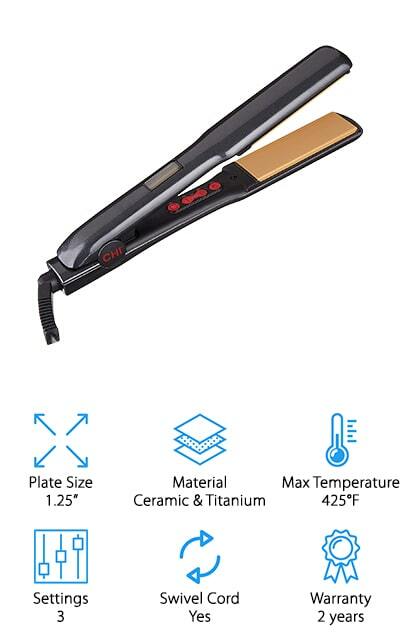 This is the best Chi flat iron for fine hair and provides you with several excellent features that you’re definitely going to want for a great look. First, the plates are 1.25”, so you get a larger amount of space to work with all at the same time. You’ll also have plates that are made with titanium and ceramic to give you the ideal level of balanced and maintained heat. Even more, the preset temperatures and the ceramic heater, as well as the dual voltage are going to give you the heat and quality that you’re going to need. The maximum temperature you’ll get from the 3 available settings is 425°F, so you can make sure you get staying power from your hair. You’ll also have a 2-year warranty that lets you know you can definitely count on quality for your system. Our budget pick is definitely a good flat iron for fine hair. It offers 5 different temperature settings with a maximum of 450°F, so you get the amount of heat that you need. The ceramic plates are 1” in size, which gives you just the right amount of space to straighten as well as the right quality and heat. You’ll be able to get smooth and silky hair and you can rotate the dial to get the temperature changes quickly and easily. Because it heats in just 15 seconds, you’re also going to have no problem getting ready and out the door faster. This system comes with a 6-month warranty that lets you know you get the durability you need. You’ll also have a swivel cord that lets you move the flat iron itself around in different configurations however you need to use it. 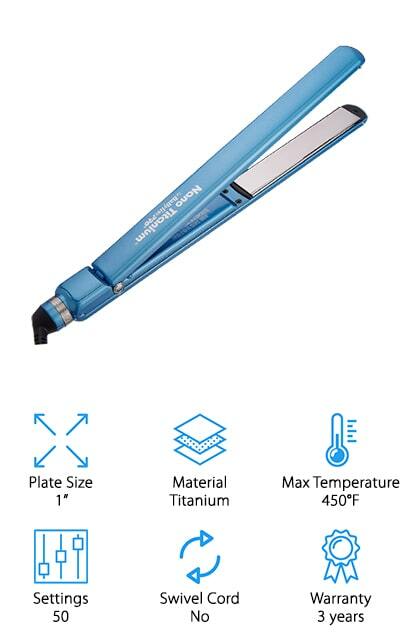 If you need a flat iron for fine hair that’s going to be easy to transport then this is a great way to go. It actually has an ultra-thin design that’s made to store away easily and it has 1” titanium plates to give you the right level of heat and smoothness. That’s because the different temperature settings are going to provide you with options when it comes to the look that you actually want. With 50 different settings, you’re going to have up to 450°F options. Here you’re getting a 3-year warranty, which means you can count on the system to last you for an extended period of time. You’ll have a fast acting system that really gets your hair looking the way you expect it to and something that you can store away when you don’t need it as well. 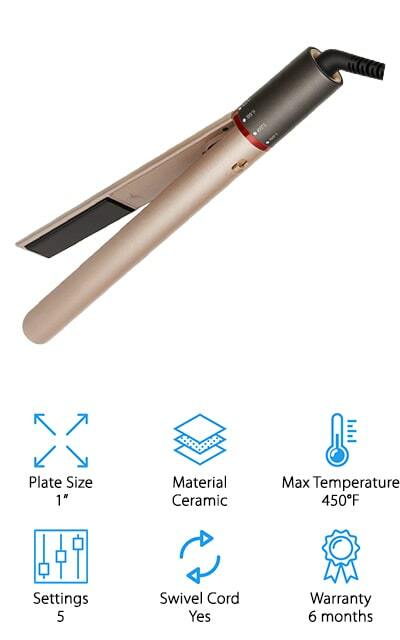 This might be the best ceramic flat iron for fine hair, which provides you with a great look. The plates are actually infused with a type of keratin micro-conditioner, which will help you get improved shine each time that you use this flat iron. On top of that, you get a dual touch styler that helps you get better damage control. Even if you’re using this flat iron daily you’ll get softer, smoother and even healthier hair and you’ll cut down on oily residue. You get to choose between 5 different temperature settings with a maximum temperature of 450°F. That means you get plenty of control and the 4-year warranty makes sure that you have something high quality to count on. This is the best flat iron for fine hair when it comes to tourmaline ceramic plates. They’re 1” plates as well, which is just the right size for you to get the job done faster. Because it’s quick to heat and has high-speed heat recovery you’ll also have no problem getting back to the heat level that you want. With 2 different temperature settings and a maximum temperature of 450°F, you’ll be able to get the ideal level of heat, silkiness, and softness for your hair while also getting the sleek look that you’re going for. The swivel cord makes it simple to move around without having to worry about tangling. It also comes with a 2-year warranty that means you’ll have durability and plenty of strength as well. You can count on it to last as long as you need it. The one-touch temperature control here means that you can get from low to medium to high with a simple touch. You get to choose between the ideal heat setting for your hair and you’ll be able to get each section of your hair easily with the swivel cord and a whole lot more. The ceramic plates are 1” and have a silky black style that provides just the right amount of heat and balance overall. That means you’re going to have a great look and you’ll have it a whole lot faster, whether you want something sleek or even curls. The 1-year warranty lets you know this is something you can count on to last. It’s specially designed for longer hair, including medium and long lengths, but still works well for shorter hair as well, so you can make sure you look the way you want. 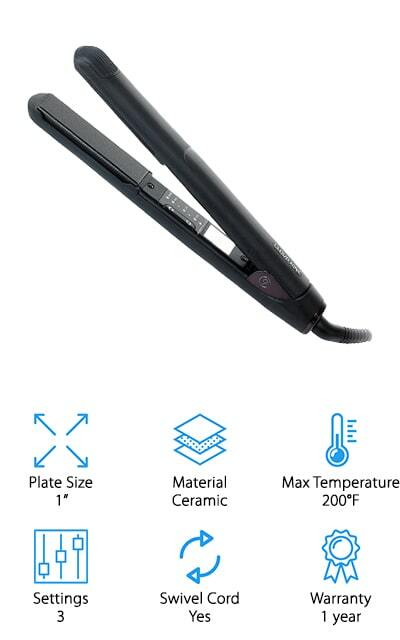 Here’s one of our best rated flat iron for fine hair. It can heat up to the top temperature setting of 450°F in just 60 seconds, which means it’s ready to go when you are and then you’ll be ready to get started on your day. The ceramic plates are larger than most at 1.25”, which means you’re going to have plenty of space to smooth out your hair quickly. It’s also great for heat balance and for maintenance because of the ceramic. You’ll have a swivel cord that’s 9 feet long, keeping you moving as much as you need without getting tangled. The 2-year warranty ensures you’re getting something durable and long lasting. It also makes sure you have a great design for medium or long hair, as well as creating a sleek look without having to worry about added heat and damage to your hair. 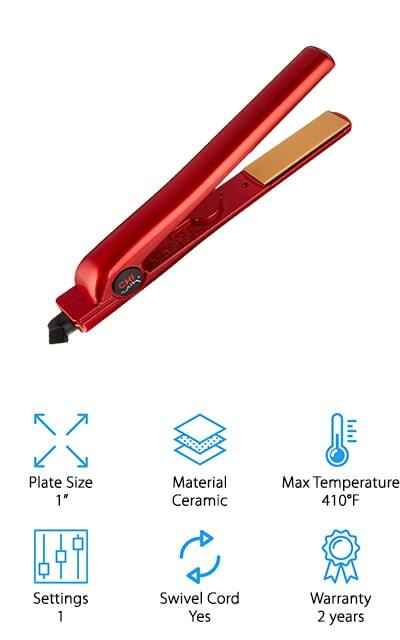 This brilliant red flat iron is definitely a great way to go and offers you tourmaline ceramic plates to provide balanced heat and just the right level as well. You’ll have several heat settings that top out at 410°F. That means you have the right amount of heat for different types of hair and different needs for hairstyle as well. You’ll be able to cut down on frizz and static, providing for a sleek and shiny look. The plates are 1” as well, which provides you with space you’ll need to get the job done quickly. The swivel cord makes for easier use and the 2-year warranty lets you know you have something that is going to last a long time. Made with high-quality materials, it’s built to last for a long time and to make sure you’re always ready to go. 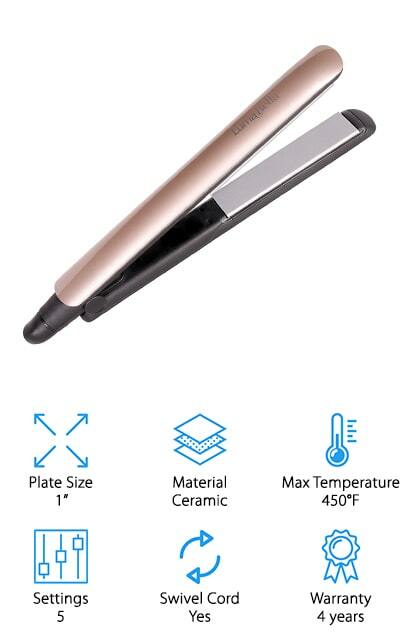 This may be the best inexpensive flat iron for fine hair and provides you with a great look that you’re going to love. The flat iron itself is definitely great looking with a white base and rose gold accent. Even more, it’s going to help you look great because the 0.8” ceramic plates are going to provide the right amount of surface you need. They provide balanced heat and they ensure you get the right level of heat as well, so your hair looks sleek and shiny but doesn’t get frizzy or damaged. The 2-year warranty is going to help you get something high quality that the company is going to stand behind. Even more, you’re getting 5 different temperature settings that range all the way up to 410°F, so you have the right level of heat for your hair. 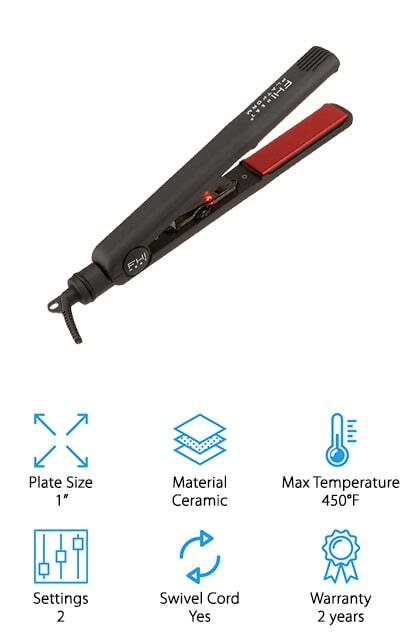 This flat iron is designed to give you a great straightening experience or a great curling experience. 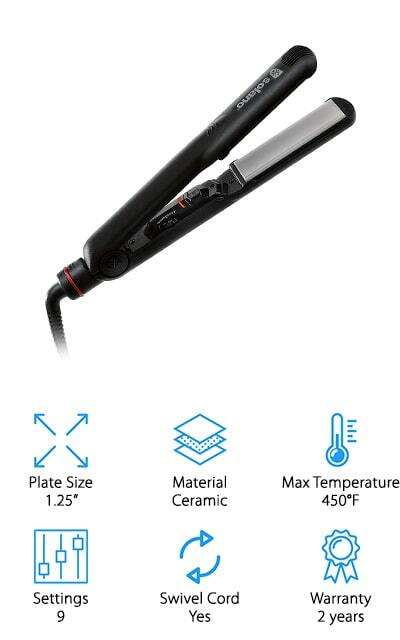 It also provides you with different temperature settings that will get all the way up to 410°F.The titanium plates provide you with 1” of space to work with at a single time, which means you’re going to have no problem getting the work done more quickly and making sure that your hair is going to look just the way you want when you want it. Ideal for any type or length of hair, this is a flat iron that you’re going to love. The bright pink color is a lot of fun and the digital panel means that you always know what temperature the iron is at so you’re ready when you need it. You just turn it on and you’ll be able to get started on your hair just like that.